This is a study I did comparing the architecture of a submerged Temple mount off the coast of Japan with Machu Picchu in Peru. I noticed a similarity in the architectural styles of both sites. The designers used an advanced method of asymmetrical design blending into existing topography. I think they are extremely advanced designs and not random chance creations. I am excerpting it from a longer power point presentation I made at Indian Crest Middle School for my good friend Joe Gunn.I hope you find this interesting. 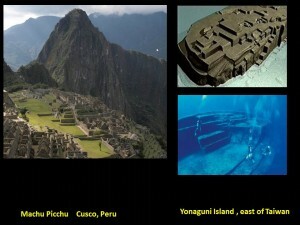 As an architect, I think the similarities between the two sites are astonishing.